Upstairs in The Victoria Tea Room, Penzance; 25 Apr 2012. Canon G11 PowerShot; 400 ISO. Dirty window and white curtain, in Penzance, Cornwall; 27 Apr 2012. Colour has been restored to the window frame and the image has been cropped to have darkness on both sides. 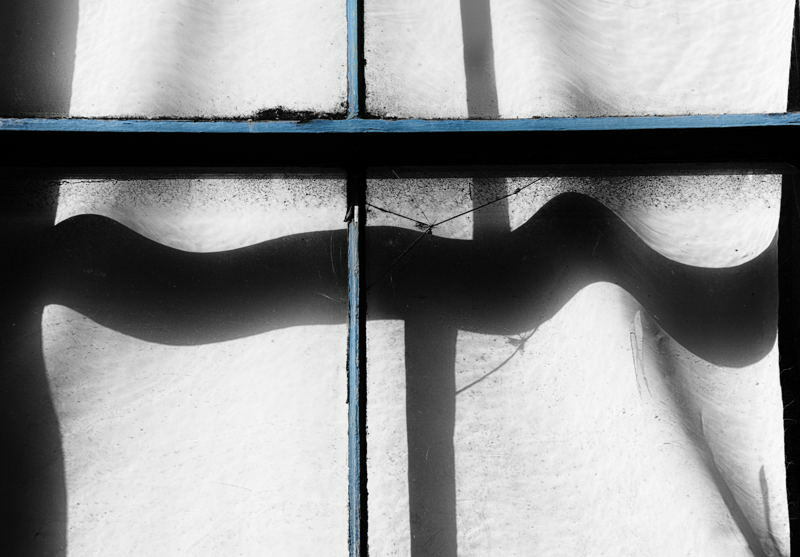 The window frame’s shadow is wonderfully convoluted by the poorly hung curtain, and this shadow has been darkened to emphasise this. The grime on the window adds to the effect. The blue frame reminds me somewhat of a crucifix, but this was certainly not in my mind when I photographed it. Nikon D700 with 70mm-300mm VR Nikkor at 300mm; 400 ISO; converted to mono and with selective colour restoration via Silver Efex Pro 2. 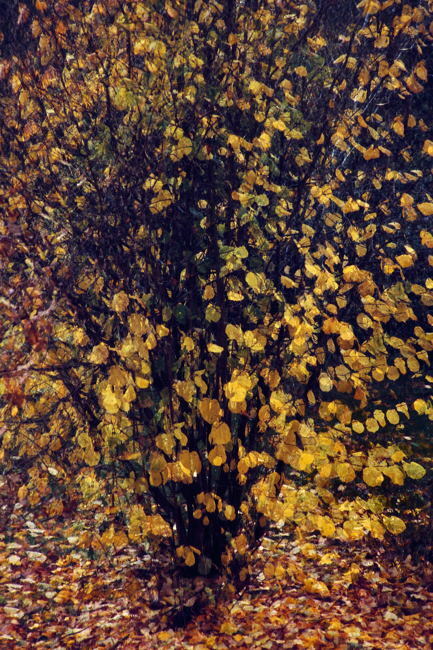 A double exposure of the Hazel tree in our garden, with the beautiful bright yellow leaves that it has in autumn; 17 Nov 2008. This wonderful tree has threatened to take over the garden more than once and I’ve had to quite severely cut it back. It does of course produce good nuts, but we always loose them – quite happily it must be said – to the Grey Squirrels. 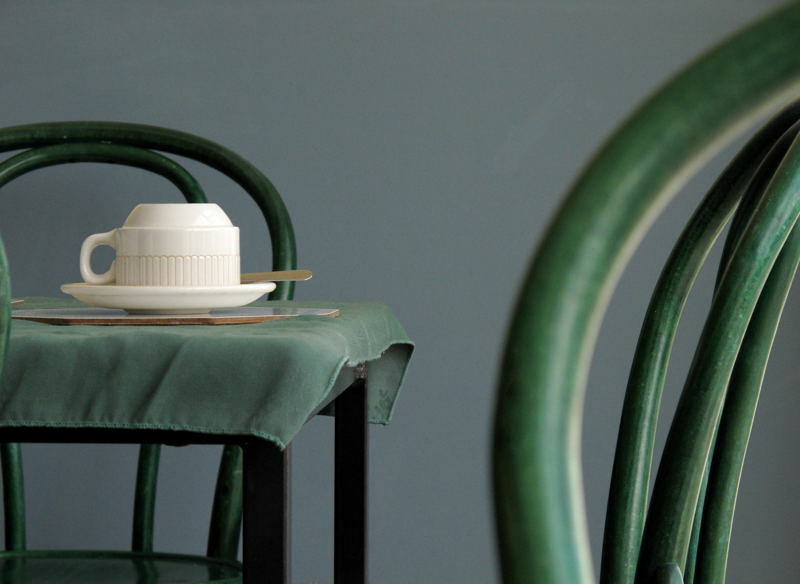 This photo is used as an eye-catcher on this blog’s front page. Nikon F6 with 24mm-120mm VR Nikkor at 120mm; Fuji Provia 400 colour slide rated at 500 ISO; the camera was moved slightly between the two exposures. Telephone boxes in the main street of Penzance; 27 Apr 2012. These two telephone boxes stand beside the road in Penzance’s main street but, because the pavement is raised, it is possible to photograph them straight on, rather than having to look up at them. 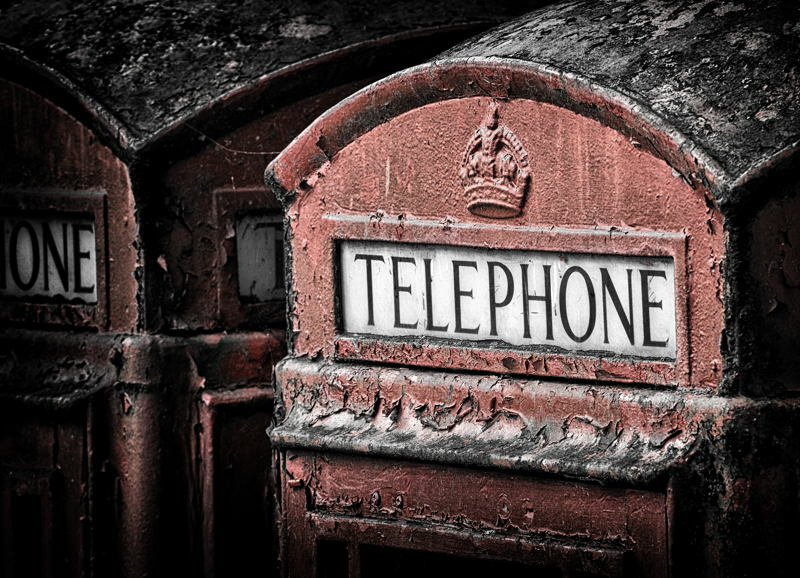 They are in poor condition and badly in need of attention – but this semi-dereliction makes for a strong photographic subject. I’ve taken them into mono and restored some of their characteristic colour, and also increased structure to help emphasise their grimy, peeling surfaces. Nikon D700 with 70mm-300mm VR Nikkor at 300mm; 800 ISO; converted to mono with selective colour restoration and other manipulation in Silver Efex Pro 2. I love this picture, it is amongst my all time favourites. Looking at it this morning, I know that she and I are in the same species – and yet we may as well be from different planets, we are worlds apart. We Westerners may be more technologically and scientifically advanced than these tribespeople, yet if there were a catastrophic world disaster tomorrow – a large meteor strike perhaps – would I rather be me, or her? In the event of such a disaster, and assuming that neither of us were killed by the impact, any bets on which of us would me the more adept at fending for ourselves in a shattered world? It would not be me – despite the fact that, very distantly, I am related by marriage to her. Here are the photo’s original words. One of two Maasai women that we met as they walked together across the open grasslands of the Maasai Mara Game Reserve, amidst the large mammals – Elephant, Lion, Hyaena, Buffalo, Hippopotamus, Leopard, Aardvark, Cheetah, Gazelle, Baboon, Giraffe, Black Rhinoceros and so on – that are an integral and accepted part of their everyday lives; April 1979. 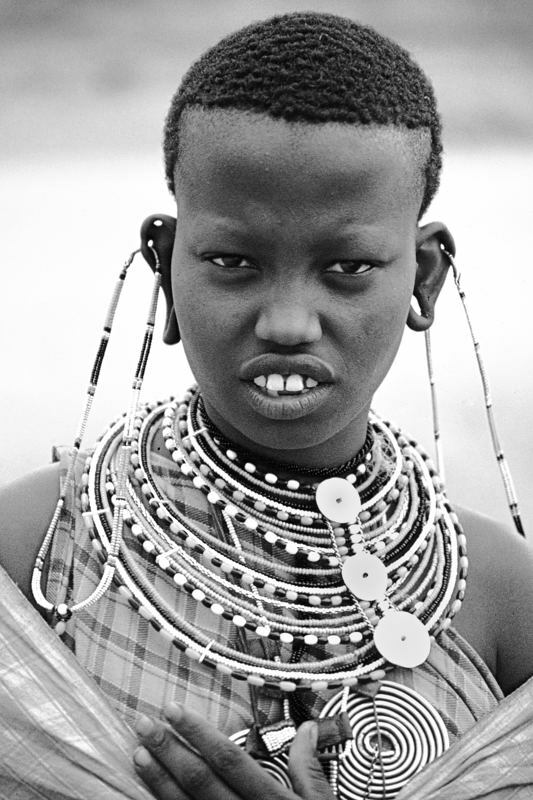 Inevitably being effected by western culture to some extent, many Maasai still lead fairly traditional lives. I have lightened the whites of her eyes, to give the photo more punch. The second woman is shown in the “Kenya (1)” post, and on this blog’s Home page. 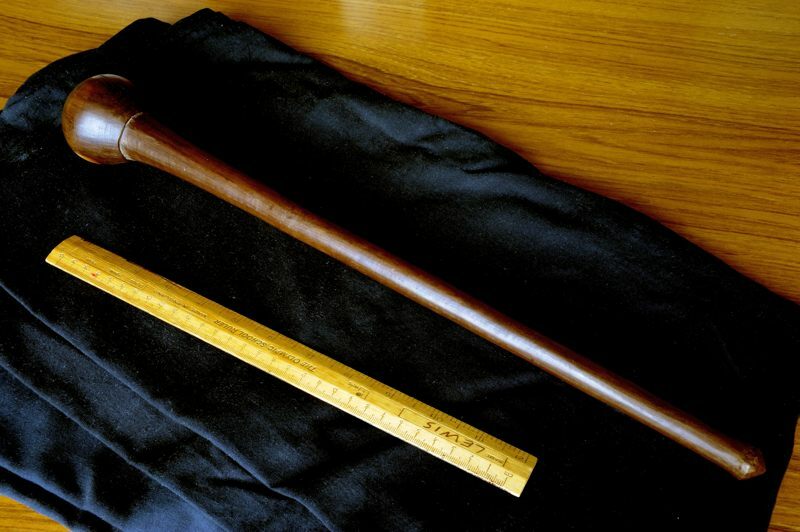 I’ve been asked to show the throwing sticks mentioned in this post’s Comments and here they are. I’d forgotten that they’re known as a Rungu. Above is the stick that was often thrust into my belt when we were out in “the bush” – mainly to ward off monkeys and baboons intent on stealing out food. But it would also be useful if threatened by people too. Its made of a single piece of wood, from a particular plant I think, and the rounded end is the part of the plant at or below ground level. The whole thing is lethal. 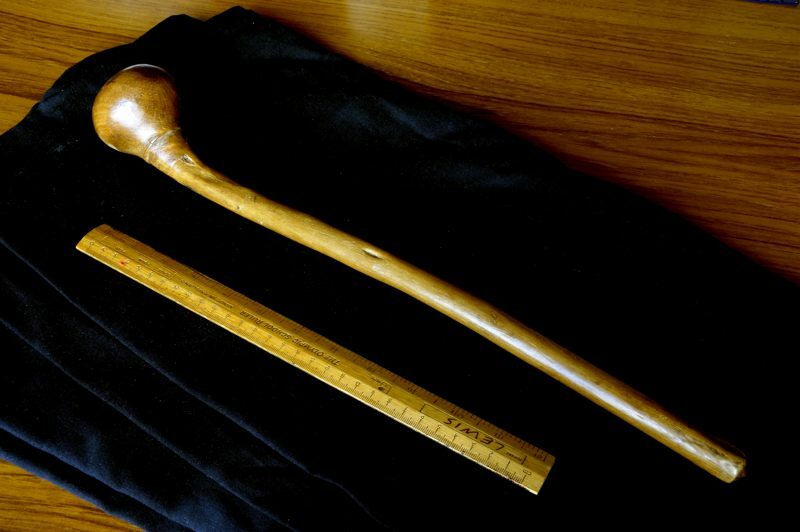 Held by the shaft and wielded as a club it could easily break someone’s skull. The other end is slightly pointed, to act as a crude stabbing weapon. And, held by this pointed end, it can be hurled through the air. With it is a 12 inch ruler. The one that I was given just prior to leaving Kenya, by the occupants of a Maasai village (a manyatta) to which I used to take tourists. 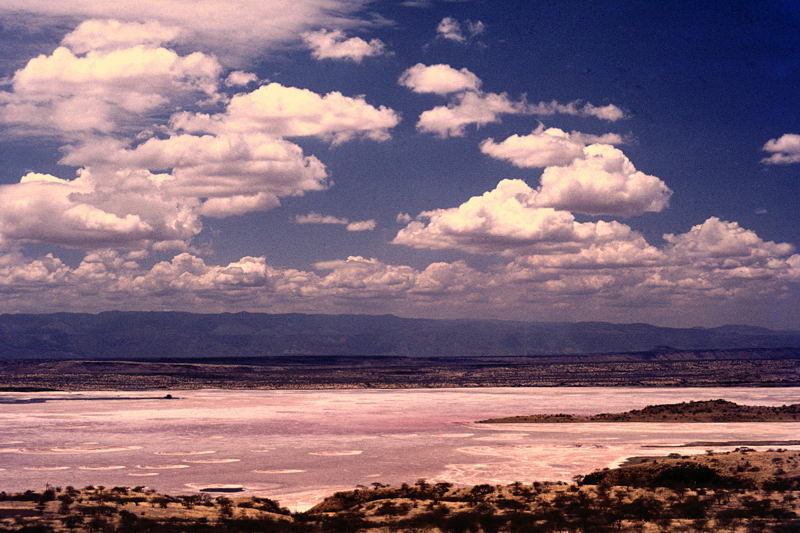 Lake Magadi, in southern Kenya; October 1978. In the upper photo, the line of hills on the horizon is the Nguruman Escarpment, the western wall of the rift valley – one of the lines along which the eastern side of the African continent is fragmenting. The vast quantities of volcanic rocks produced during the formation of the rift valley are very rich in sodium, which weathers out of these rocks in solution as sodium bicarbonate. Lake Magadi, looking like its covered in slightly pinkish snow here, is situated at a low altitude in an area of the rift that is one of the hottest and driest parts of Kenya, and it lacks an outflow. Sodium bicarbonate weathers out from the surrounding volcanic rocks and is transported into the lake in solution via streams and groundwater. The concentration of sodium bicarbonate in the lake increases as more and more water containing bicarbonate enters the lake – while more and more of the lake’s water evaporates in the ferociously hot climate. When the lake’s waters become saturated with the bicarbonate, sodium carbonate is precipitated as a solid mineral. This carbonate forms a white crust on the lake’s surface, which is tinged pink by red algae which proliferate in the highly alkaline water. Hot springs around the lake are sufficiently alkaline to feel soapy to the touch, i.e. as they immediately start dissolving your skin! The whole place reeks with the soda’s rank, sulphury smell, and the soda is extracted here commercially. The lower photo shows the lake’s soda crust. The jagged soda ridge in the foreground is about six inches high where it casts a very black shadow near the center of the shot. I purposely made this ridge emanate from the picture’s lower right corner so that it would act as a leading line, drawing the viewer’s eyes ever more deeply into the picture and on out towards the horizon. On the horizon, very slightly to the left of this “six inch cliff”, is the distinctive outline of the Shompole volcano, which is on the border with Tanzania. 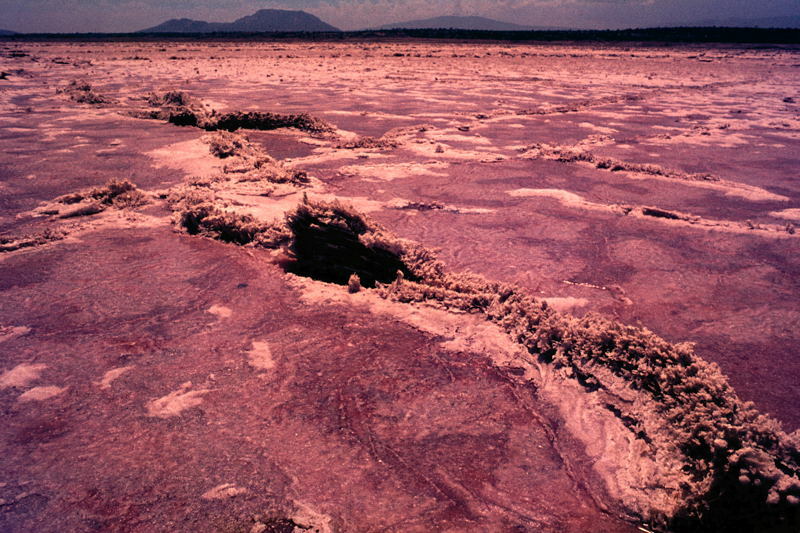 Venturing out onto Lake Magadi’s crust is extremely hazardous, because it can give way at any moment, plunging the unwary into a warm and highly caustic mixture of sodium carbonate and bicarbonate that will cause serious burns. OM-1 with 28mm Zuiko and polarising filter; Agfa CT18 slides rated at 64 ISO. 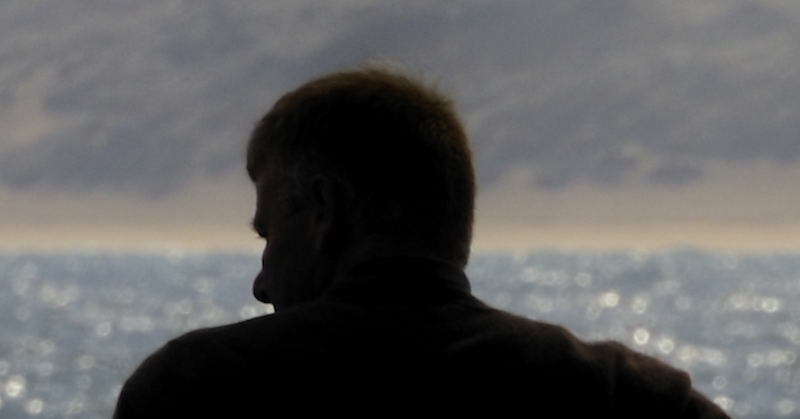 Man looking out to sea at St Ives, Cornwall; 24 Apr 2012. This is a colour version and very different crop of another image, which can be found here . We are now much closer up behind the man – even his eyebrows and lashes can be seen. And I’ve lightened the sparkling sea that he’s looking out over, and also introduced a cold blueness to all non-silhouetted parts of the picture. This is a very different picture now – which do you prefer? Nikon D700 with 70mm-300mm VR Nikkor at 300mm; 400 ISO; digitally manipulated in Nikon’s Capture NX2. I received the comment here from Meanderer yesterday, and immediately thought that, at long last, she’d finally lost it – you know, the lights are on but there’s nobody … that sort of thing .. but in true FATman style – did I tell you that I’m an oppressed mass? – it now emerges that she’s 100% right and I’m, well, you know, I’m … not … >>> SO APOLOGIES!!! I have two versions of the above picture. The one above is the one I posted under Self-Indulgence yesterday, whereas the one I oroginally posted had more intense blues – and its the one posted below. So, making the best of a botched job, which do you … prefer … if any … ? .Flattened “beer” can from a Bristol gutter; 21 Mar 2004. I’ve put the word beer in quotes because, in my opinion, this well known brand only just merits that description – and do you remember their “Reassuringly expensive” advertising slogan?! What a load of ****************!!!! 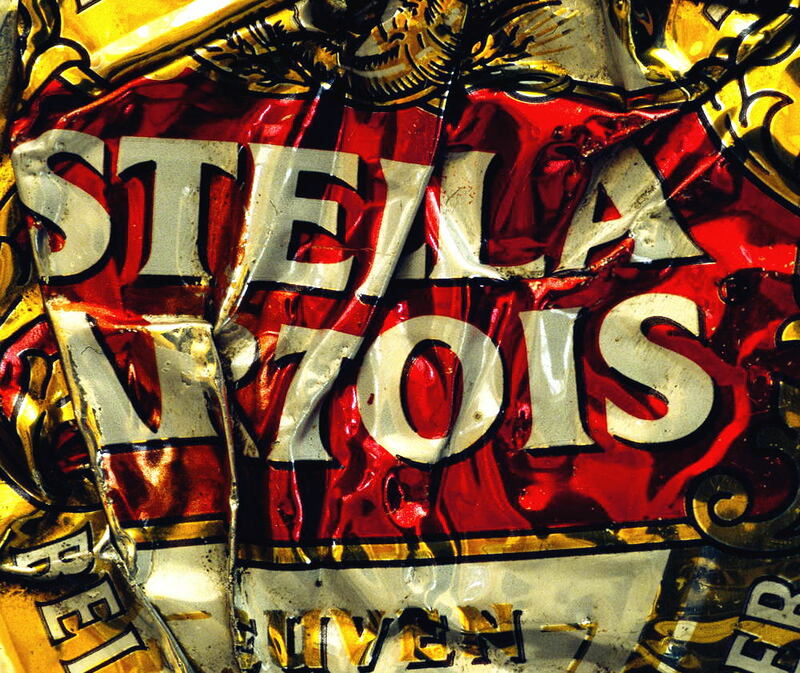 Stella is made by one of the vast brewing giants and, well, it has some taste and it makes me drunk – but a taste experience? Well, no. Belgium has far, far tastier brews than this – Duvel is my out and out favourite, but at 8.5% alcohol this frothy, innocent looking, golden ale is not for drinking down recklessly – unless lying down helpless on the floor is your thing of course. Other Belgians? The two Westmalle beers, the Dubbel and the Tripel. And much as I like Hoegaarden itself, its Grand Cru, Forbidden Fruit and Julius stablemates are rather naughtier – tho whether they are all still in production and / or generally available I don’t know. And also John Martin’s, and Arabier, Barbar, Abbaye de Bonne Esperance, Saison de Silly and many more – but, no longer as good as they were, the various Chimay beers. Belgium is the top country in the world for beer, in terms of quality and sheer variety – a week there and I’d be down on the floor with alcoholic poisoning! Tripod-mounted OM-4 with 90mm Macro Zuiko; Fuji Velvia 50 colour slide, rated at 64 ISO. Nikon D700 with 24mm-120mm VR Nikkor at 24mm; 400 ISO; diffused, bounced flash; converted to mono with Silver Efex Pro 2. Alleyway just off the main street in Ilfracombe, north Devon; 3 Oct 2007 >>> and see another, more cropped (and I think, better) interpretation of this picture on the “W-I-D-E-1” page, here . Ilfracombe is a wonderful place for photography. Parts of it are distinctly unkempt and interesting views, patterns, colours and textures are all around. 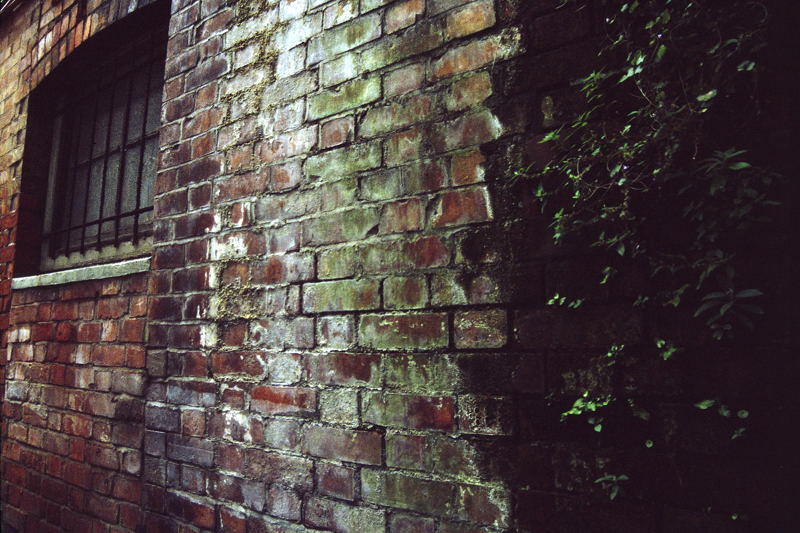 Here, I like the off-white and green coated roughness of the wall, and the way the lines in the brickwork draw my eye back to the prudently barred window. A few leaves make it out into the light from the shrub in the shadows on the right. Nikon F6 with 24mm-85mm Nikkor at 24mm; Fuji Provia 400X colour slide rated at 1600 ISO.